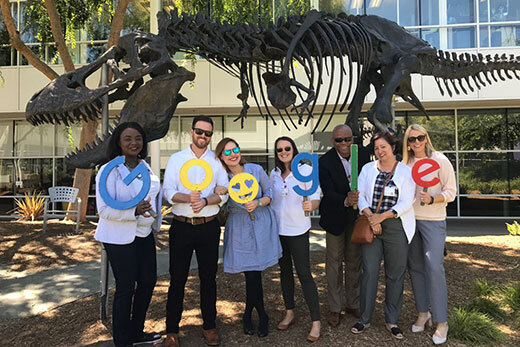 Students in Goizueta Business School's Modular MBA for Executives program visited Google during the West Coast Business Practice Immersion, which offered an inside look at some of the world's most innovative companies. One week, two cities, 13 onsite corporate immersions, dozens of speakers providing limitless insights, and facilitation and support from more than 30 Emory alumni. For students in Goizueta Business School's Modular MBA for Executives (MEMBA) program, the West Coast Business Practice Immersion was a whirlwind of learning, networking and growing for students as they visited Seattle, San Francisco and Silicon Valley in June. The trip is a new immersion experience at Goizueta that exposes students to technologies, practices and cultures that have fundamentally restructured business practices in the 21st century. Andrea Hershatter, who teaches entrepreneurship and is senior associate dean of Goizueta's BBA Program, led students through a series of experiences designed to provide insights into disruptive technologies, innovative workforce cultures and high-growth ventures occurring within the West Coast ecosystem. The course consisted of a series of site visits, including Starbucks, Google, Survey Monkey, Uber, Fitbit and Amazon, as well as guest speakers and alumni networking events. “While many of our MEMBAs conduct business with West Coast companies and some live and work out there, there is particular value in immersion into the culture and perspectives of many of the world’s most forward-thinking companies including the top three of Fast Company’s 2017 World’s Most Innovative Companies,” Hershatter said. The MEMBA program is a hybrid structure (70 percent face-to-face and 30 percent distance) that is ideal for professionals across a variety of fields. The program offers everything from the general management curriculum to immersive learning experiences, as well as flexible, online coursework and in-person residencies. While the ecosystem on the West Coast, particularly in Seattle, San Francisco and Silicon Valley, offers a magnetic lure that attracts talent, ideas and the capital and resources needed for deployment, Hershatter said the firsthand exposure to a multifaceted set of approaches and perspectives helps students understand important drivers of change and innovation. “It allows them to draw their own conclusions about the myths and realities of the West Coast environment,” Hershatter said. Students were able to visit with a wide range of companies through the immersion experience. The oldest companies were Microsoft, founded in 1975, and Starbucks, where the original beanery opened in 1971. Two others launched in the 1980s, three in the 1990s, four in the 2000s and three since 2010. Half of the companies have a market cap of over $100 billion, while two are in startup phases, having raised between $40 and $60 million. Six are publically traded, two are subsidiaries of public companies and five are privately held. “In aggregate, observing impact and innovation across a diverse array of industries of varying scale and utilizing widely disparate business models was extraordinarily illuminating,” Hershatter said. Students had the opportunity to hear directly from, among others, Emory BBA and MBA alumni Zander Lurie, CEO of Survey Monkey; Bill Carr, former head of digital music and video at Amazon; Will Hockey, founder and CTO at Plaid; Josh Sigel, COO at Innit; Andy Simpson, creative strategist at Facebook and Steve Carlin, chief strategy officer at Softbank Robotics. “Our alumni not only led sessions themselves but also brought in C-suite and managing director-level colleagues who gave generously of their time and insights,” Hershatter said. When Doug Bowman, Goizueta's former senior associate dean for working professional MBA programs, first envisioned the West Coast experience, his intention was to add to the already existing immersions that allow students to develop additional perspectives while also building deeper relationships with their classmates. The goal of the class, for Hershatter, was for students to not only develop their own understanding and conclusions about the environments they witnessed, but also identify some practices and approaches worthy of emulation in their own environments.